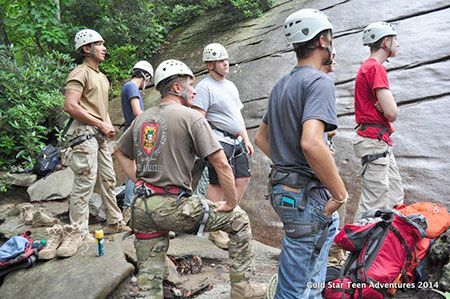 Gold Star Teen Adventures recently put on an Outdoor Leadership Camp in the mountains of Western North Carolina. Twenty teens from all across the U.S., the camp advisers who are students at military academies, as well as the organization’s founder, Major Kent Wilheim, descended on the mountains of North Carolina. 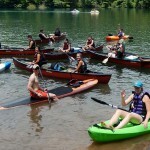 As part of our desire to be supportive of veterans and their families, Duotech partners with Gold Star Teen Adventures, who provide unique summer adventure opportunities for Gold Star Youth, to set up this first annual Outdoor Leadership Camp. The youth, whose parents lost their lives serving their country as special forces operators, travel from all over the United States to attend this week-long event. Dan and Cheryl Rogers of Duotech Services, Inc. are both very supportive of GSTA and Major Kent Solheim. They have been friends with Kent since they met him with Veterans Airlift Command closer to ten years ago. 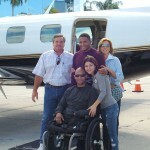 Veterans Airlift Command is another veterans organization that Dan and Cheryl are members of. Cheryl and I are a part of the GSTA organization and was asked by Maj. Solheim to manage and organize the Franklin GSTA events. Our passion is for our troops, their families and children of the fallen. Providing logistical support to Major Kent Wilheim, a member of the U.S. Army’s Special Forces and founder of the Gold Star Teen Adventures, Duotech met the needs of this children as the primary sponsor and also providing local volunteers to help throughout the week. The camp began the first day at Ft Bragg, NC then traveled to Brevard, Franklin, and Nantahala in NC. These volunteers used all along the trip were enlisted to drive shuttle buses around Western North Carolina, providing and preparing meals, lending and donating hiking gear, sleeping bags, and backpacks, as well as offering medical assistance during the adventures. The first day at Ft Bragg on Sunday the teens were taught leadership skills and orientation by the same warriors who would have worked side-by-side with the teen’s parents. On Monday they enjoyed rock climbing in Brevard, NC. They then boarded the bus and moved onto their staging area in Franklin, NC. From that base camp, they would hike an approximate distance of ten miles on the Appalachian Trail. The group would return that night to camp and practice a few survival skill techniques. The next morning they would go to Nantahala Outdoor Center to raft down the whitewater of the Nantahala River and also participate in the NOC Ropes Course. Wednesday night would be the final night, the ceremony for awards and a final big meal before they traveled back to their homes on Thursday. A couple of the teens were interviewed by WLOS of Asheville, NC, and the Franklin Press and Macon News, both of Franklin, NC. If you would like to help out as a sponsor of future Outdoor Leadership Camp of the Gold Star Teen Adventures, held in Franklin, NC in 2015 contact Duotech Services for information at About@DuotechServices.com.